There have been significant advances in the synthesis and physical realization of microwave filter networks, but until now, no book has provided a coherent and readable description of system requirements and constraints, fundamental considerations in theory and design, up–to–date synthesis techniques, or EM–based design tools. 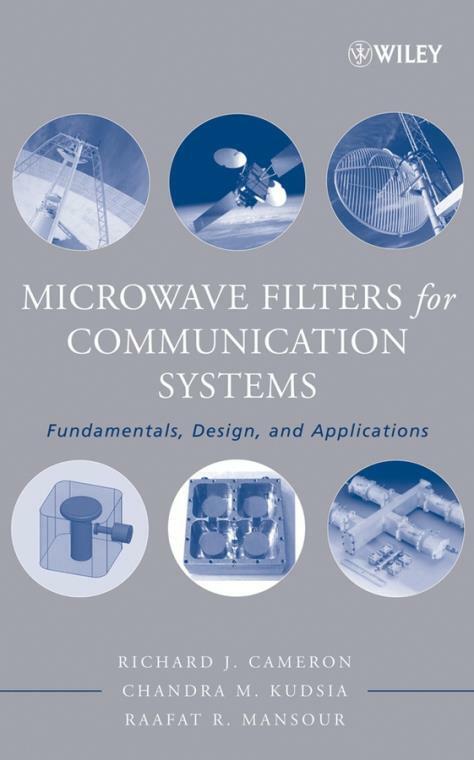 Microwave Filters for Communication Systems fills the need for such a book, providing comprehensive coverage of microwave filter design and applications for communication systems. This topical book provides students and practitioners with a strong theoretical understanding of filter design, as well as the EM–based tools being used in the optimization of microwave filter and multiplexing networks. 1. Radio Frequency (RF) Filter Networks for Wireless Communications–The System Perspective. PART I: INTRODUCTION TO A COMMUNICATION SYSTEM, RADIO SPECTRUM, AND INFORMATION. PART II: NOISE IN A COMMUNICATION CHANNEL. PART III: IMPACT OF SYSTEM DESIGN ON THE REQUIRMENTS OF FILTER NETWORKS. 2. Fundamentals of Circuit Theory Approximation. 3. Characterization of Lossless Lowpass Prototype filter functions. 4. Computer–Aided Synthesis of Characteristic Polynomials. 5. Analysis of Multiport Microwave Networks. 6. Synthesis of a General Class of the Chebyshev Filter Function. 7. Synthesis of Network – Circuit Approach. 8. Coupling Matrix Synthesis of Filter Networks. 9. Reconfiguration of the Folded Coupling Matrix. 10. Synthesis and Application of Extracted Pole and Trisection Elements. 12. Waveguide and Coaxial Lowpass Filters. 13. Waveguide Realization of Single– and Dual–Mode Resonator Filters. 14. Design and Physical Realization of Coupled Resonator Filters. 15. Advanced EM–Based Design Techniques for Microwave Filters. 17. AllPass Phase and Group Delay Equalizer Networks. 18. Multiplexer Theory and Design. 19. Computer–Aided Diagnosis and Tuning of Microwave Filters. 20. High–Power Considerations in Microwave Filter Networks.